Chinese President Xi Jinping speaks as he chairs a summit of the Forum on China-Africa Cooperation in Beijing on Sept. 4, 2018. But a series of recent incidents, including cases of media censorship and heavy-handed academic controls, have cast doubt on that promise. China’s financial muscle is rapidly translating into political muscle across the continent. At a major South African newspaper chain where Chinese investors now hold an equity stake, a columnist lost his job after he questioned China’s treatment of its Muslim minority. In Zambia, heavily dependent on Chinese loans, a prominent Kenyan scholar was prevented from entering the country to deliver a speech critical of China. In Namibia, a Chinese diplomat publicly advised the country’s President to use pro-China wording in a coming speech. And a scholar at a South African university was told that he would not receive a visa to enter China until his classroom lectures contain more praise for Beijing. Mr. Xi’s promise to African leaders in early September was the latest reiteration of a frequent Chinese boast: a non-interference pledge that often wins applause from a continent with a history of Western colonialism and conditional World Bank loans. China routinely touts its financial engagement with Africa as a “win-win” situation for both sides, in contrast to exploitative Western policies. For years, Africa has embraced China’s offers of investment, loans and trade. Chinese money has become the biggest new source of financing and investment in many African countries. But there are growing concerns that this assistance might not be as benign as they had once believed. African governments and businesses, eager for Chinese funds, are increasingly willing to suppress or censor viewpoints that Beijing does not like. Backed by dramatically rising investment and loans, Chinese influence is sharply increasing in African media, academia, politics and diplomacy. One of the most obvious examples is the increasing isolation of Taiwan. Three years ago, four African countries still gave diplomatic recognition to Taiwan, to the displeasure of Beijing. Today, three of those four countries have switched to Beijing’s side, lured by Chinese aid. Only the tiny kingdom of eSwatini (formerly known as Swaziland) still supports Taiwan. 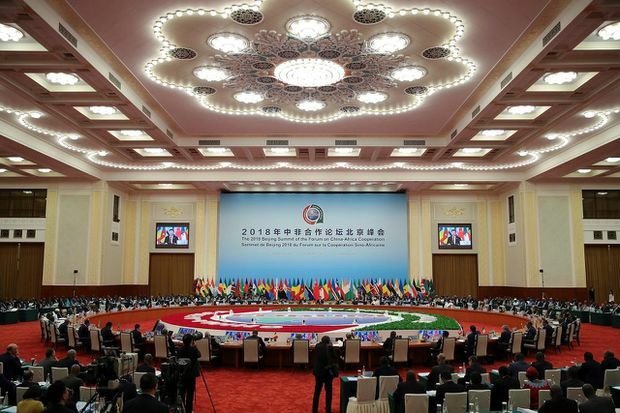 Another sign of Beijing’s political power is the huge number of African leaders who flock to the summit of China’s main African organization: the Forum on China-Africa Cooperation (FOCAC). More than 50 African leaders attended the latest FOCAC summit in China last month, where Mr. Xi announced his US$60-billion pledge. In fact, many more African leaders attended the Beijing summit than the United Nations General Assembly in New York, where fewer than 30 African leaders were in attendance this year. Political praise for China is widespread across Africa. The ruling party in South Africa, the African National Congress, has lauded the Chinese Communist Party as “a guiding lodestar” for the ANC. In the academic sphere, China has rapidly expanded its influence by promoting the establishment of Confucius Institutes, which teach Chinese language and culture with a curriculum that is largely funded and controlled by the Chinese government. There are now 54 Confucius Institutes in Africa – more than the number of cultural centres of any other government except France. Even outside these institutes, Beijing seeks to influence the message in African classrooms. Ross Anthony, director of the Centre for Chinese Studies at Stellenbosch University in South Africa, has described how he was denied an entry visa to China this year because the Chinese authorities disliked his classroom lectures. China is increasingly insistent that Africans should represent China “in a particular way – Beijing’s way,” Mr. Anthony wrote in a separate article in a South African newspaper. Meanwhile, Beijing has expended an enormous amount of energy and money on efforts to cultivate the African media. It has brought hundreds of African journalists to China for all-expenses-paid “study tours” in which the government’s views are propagated. It launched a program in 2015 to provide “training” for 1,000 African media professionals annually. And it has begun to provide thousands of African villages with a Chinese-owned satellite-television service, featuring a range of Chinese news and entertainment channels. China has spent hundreds of millions of dollars to set up African branches of China’s state-owned television channels and newspapers. It imposes tight editing control on its African journalists – barring them from covering the Pope’s visit to Kenya in 2015, for example. China has also invested directly in African media companies. In 2013, for example, Chinese state agencies purchased 20 per cent of Independent Media, the biggest newspaper chain in South Africa. Since then, the newspapers in this chain have increasingly adopted a pro-Beijing slant in their opinion articles. And they have become less tolerant of criticism of China. Azad Essa, a regular columnist for Independent Media, knew that his bosses might not be happy with his column criticizing China’s mass-indoctrination camps for its Uyghur minority. But the reaction was swifter than he expected. A few hours after his column was published in print editions last month, he was told that it would not be posted online. A day later, his column was permanently cancelled. He was told that the cancellation was merely because of a “redesign” of the newspapers – an explanation he does not believe. In Zambia, there was controversy when the police force hired eight Chinese nationals to serve as officers in the force. The move was quickly cancelled. The government has agreed to a joint venture between Zambia’s state broadcaster, ZNBC, and a private Chinese company called StarTimes, which has become one of Africa’s biggest digital TV operators with nearly 20 million users. Under the agreement, StarTimes will own 60 per cent of Zambia’s new digital television service, and it can use this revenue to repay a US$273-million loan from a Chinese bank. Zambia’s social media have been consumed by debate over whether this business deal could pave the way for China to take control of the state broadcaster. The government has denied it.